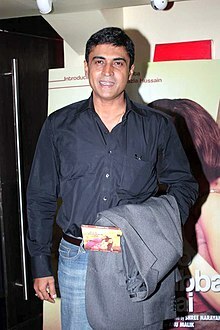 Mohnish Bahl (born 14 August 1961) is an Indian actor working in the Indian film industry and on Indian television. He is the son of actress Nutan and Lt. Cdr. Rajnish Bahl, and a prominent member of the Mukherjee-Samarth family. Starting his career in 1983 through the film Bekaraar, he entered limelight through the film Maine Pyar Kiya in 1989, starring Salman Khan and Bhagyashree, in which he portrayed the villain role. The success of the film transformed Bahl's career and led to him being a very busy villain and character actor. Other notable roles he did was in the 1992 hit Deewana which was the debut of Shah Rukh Khan. He was a regular in Sooraj R. Barjatya films such as Hum Aapke Hain Koun...!, Hum Saath Saath Hain. 1995: Nominated, Filmfare Best Supporting Actor Award for Hum Aapke Hain Koun..! ^ "Mohnish Bahl". Rottentomatoes.com. Retrieved 7 September 2016. ^ Salvi, Deepak (4 August 2004). "Actor Mohnish Bahl's father dies in fire". Rediff.com. Retrieved 7 September 2016. ^ a b Vijayakar, By Rajiv (8 July 2015). "When black was better than white: From heroes to hit villains". Bollywoodhungama.com. Retrieved 7 September 2016. This page was last edited on 15 March 2019, at 11:11 (UTC).